Just wanted to point you all to Wayne Larsen's alternate interface to Hackernews, called hckr news. I really like the clean and fast interface, compared to the everlasting old interface on the original page (even though you can of course use User CSS to pep it up a little). Wayne also created browser extensions that do a little more good to the old Hacker News interface. He also included my Collasible Threads bookmarklet. Thanks! You currently can't subscribe to an authenticated feed (for example in Basecamp) in Google Reader. If you don't mind giving away your credentials you can also use Free My Feed. This is useful when you are reading a thread and decided that you are having enough of it and want to move on to the next thread. Before you had to scroll all the way up to the top post and collapse that one. There is some back and forth by John Gruber and others, about HTML <title> tags, with Gruber complaining (and rightly so) that for SEO reasons the titles are filled up with junk having little to do with the real page content. The writers of cam.ly suggest to use the SEO title in the HTML and have something proper be displayed in Google by using an OpenSearch description. But this still doesn't solve the problem of bloated window titles and bookmarks. I enjoy consuming and participating at Hacker News by Y Combinator resp. Paul Graham. One thing that needs improvement is the reading comments there. At times it happens that the first comment develops into a huge thread, and then the second top-level comment (which might also be well worth reading) disappears somewhere down into the page. Reddit has combatted this common problem by making threads easily collapsible. I think it is worth having this also on Hacker News, so I implemented it and wrapped it into a bookmarklet so that you can use this functionality on-demand at Hacker News. 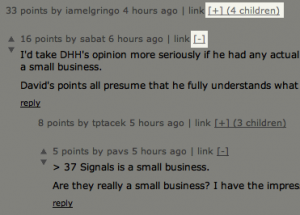 As soon as it is available in your bookmarks bar, go to Hacker News and click on it when viewing a comments page. Next to each thread a symbol [+] will appear. Click it to collapse the thread and it will change to a [-]. Click that to expand the thread again. The Hacker News HTML source code seems quite fragile in the sense that the comments section of a page can't be identified in a really unique way (for example it does not have an HTML id attribute), so it might break when the layout of the page changes. This is why the bookmarklet is actually only a loader for the script on my server. I have tuned the HTTP headers in a way that your browser should properly cache the script so that the speed of my server should not affect the loading of the bookmarklet. Update March 18, 2011: Paul Biggar has contributed a greasemonkey script that also works on Firefox 4. I have adapted it so that it also works (which basically involved copying the jQuery script above mine) in Safari and Chrome (using NinjaKit). Update November 22, 2011: Eemeli Aro has sent me a little CSS tweak so that the lines don't move around when collapsing. The code downloadable from above contains his code. Thank you! It needs to be stated first that if you haven't read and followed Steve's first book, you should go and do that first. It's a must-read that makes it pretty easy to understand why your page might be slow and how to improve it. In "Even Faster Web Sites", Steve and his co-authors walk a fine line between fast and maintainable code. While most techniques described in his first book could be integrated with an intelligent deployment process, it is much harder with "Even Faster Web Sites". In the chapters that Steve wrote himself for "Even Faster Web Sites," he is pretty much obsessed with analyzing when, in what sequence, and how parallel the parts of a web page are loaded. Being able to have resources transfered in parallel lead to the highest gains in page loading speed. The enemy of the parallel download is the script tag, so Steve spends (like in HPWS but in greater detail in this book) quite a few pages analyzing which technique of embedding external scripts lead to which sequence in loading the resources of the page. Steve also covers interesting techniques such as ways to split the initial payload of a web site (lazy loading) and also chunked HTTP responses into consideration that allow sending back HTTP responses even before the script has finished. Downgrading to HTTP/1.0 can only be considered as hard-core technique that just huge sites such as Wikipedia are using right now and should be considered being covered for educational reasons only. There is a section focussing on Optimizing Images which thankfully takes the deployment process into consideration and shows how to automate the techniques they suggest to optimize the images. Speaking of appendices, I love what Steve has put in here: he shows a selection of the finest performance tools that can be found in the field. This book can help you make your site dangerously fast. You also need to be dangerously careful what tips you follow and how you try to keep your site maintainable at the same time. "Even Faster Web Sites" is great for people who can't get enough of site optimization and therefore a worthy sequel to "High Performance Web Sites," but just make sure that you also read and follow Steve's first book first. The book has been published by O'Reilly in June 2009, ISBN 9780596522308. This time I'm reviewing a book by Andy King. Unlike High Performance website by Steve Souders, it doesn't solely focus on the speed side of optimization, but it adds the art of Search Engine Optimization to form a compelling mix in a single book. If you have a website that underperforms your expectations, this single book can be your one-stop shop to get all the knowledge you need. Andy uses interesting examples of how he succeeded in improving his clients' pages that illustrate well what he describes in theory before. He not only focuses on how to make your website show up at high ranks in search engines (what he calls "natural SEO"), but also discusses in detail how to use pay per click (PPC) ads to drive even more people to one's site. I especially liked how Andy describes how to find the best keywords to pick and also describes how to monitor success of PPC. The part about the optimization for speed feels a little too separated in the book. It is a good read and provides similar content as Steve Souders book, though the level of detail feels a little awkward considering how different the audience for the SEO part of the book is. Still, programmers can easily get deep knowledge about how to get that page load fast. Unfortunately Andy missed out a little on bringing this all into the grand picture. Why would I want to follow not only SEO but also optimize the speed of the page? There is a chapter meant to "bridge" the topics, but it turns out to be about how to properly do statistics and use the correct metrics. Important, but not enough to really connect the topics (and actually I would have expected this bridging beforehand). Altogether I would have structured things a little different. For example: It's the content that makes search engines find the page and makes people return to a page, yet Andy explains how to pick the right keywords for the content first whereas he tells the reader how to create it only afterwards. Everything is there, I had just hoped for a different organization of things. All in all, the book really deserves the broad title "Website Optimization." Other books leave out SEO which usually is the thing that people mean when they want to optimize their websites (or have them optimized). I really liked that the topics are combined a book and I highly recommend the book for everyone who wants to get his or her website in shape. The book has been published by O'Reilly in July 2008, ISBN 9780596515089. Also take a look at the Website Optimization Secrets companion site. Thanks to Andy for providing me a review copy of this book. 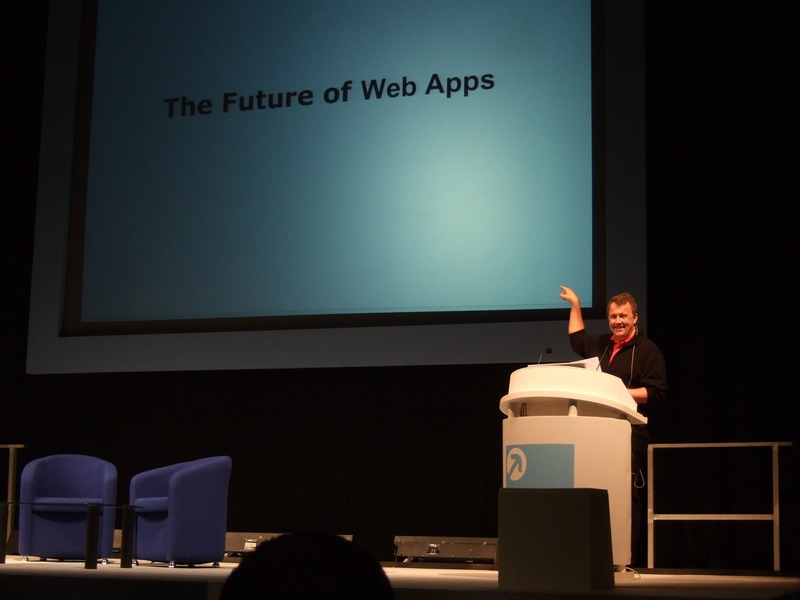 I have been attending this year's Future of Web Apps Expo in London's ExCeL centre. There were a ton of interesting speakers and I enjoyed listening a lot. Amongst others there were Steve Souders of Yahoo (High Performance Web Sites), Paul Graham of Y Combinator (The future of web startups), Matt Mullenweg of WordPress.com (The architecture of WordPress.com, he was the only one to go into some detail) and Kevin Rose of digg (Launching Startups). I also enjoyed Robin Christopherson's talk very much. He is vision impaired and showed how he browses the web (amazing how fast he had set the speed of his screen reader — I know why and guess that most vision impared people turn up the speed, yet it still feels awkward to listen to it) and which challenges therefore arise. Unfortunately Chris Shiflett only held a workshop which I was not attending. The conference was clearly not so much for developers (at some points I would have greatly enjoyed some delving into code), so I am trying to keep my eyes open for even nerdier conferences :) Any suggestions? On the evening of the first day there was a "live" diggnation recorded which was pretty fun. 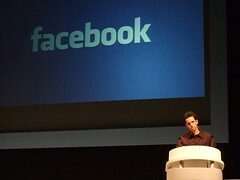 According to Ryan Carson, he will be publishing audio files of the talks on www.futureofwebapps.com soon. Thanks to Carsonified for installing this great conference. I hope I will be able to return next year. I have posted more photos to flickr. I'd like to introduce you to this great book by Steve Souders. There already have been several reports on the Internet about it, for example on the Yahoo Developers Blog. There is also a video of Steve Souders talking about the book. The book is structured into 14 rules, which, when applied properly, can vastly improve the speed of a web site or web application. Alongside with the book he also introduced YSlow, an extension for the Firefox extension FireBug. YSlow helps the developer to see how good his site complies with the rules Steve has set up. For instance he shows how it is possible to reduce the number of HTTP requests (by inlining the script sources) for first time visitors, while still filling up their cache for their next page load (see page 59ff). The small down side of this book is that some rules need to be taken with care when applied to smaller environments; for example, it does not make sense (from a cost-benefit perspective) for everyone to employ a CDN. A book just can't be perfect for all readers. If you are interested in web site performance and have a developer background, then buy this book (or read it online). It is certainly something for you. The book has been published by O'Reilly in September 2007, ISBN 9780596529307. Webkit, the rendering Toolkit that powers Apple's Safari web browser, is getting a lot of love lately (iPhone, Windows beta version). But for developers it was always hard to debug and inspect your web applications running in Safari. With Drosera a decent debugger exists since June 2006 (for Webkit only so far, though — it's not going to happen with Safari 2). This is a big step, giving web developers not only the chance to precisely identify why this or that DOM element is shown in the way it is, but it also allows a look into how the web page loads, much like Firebug on Firefox. As a neat extra, you can view how your components add to the loading time of the page. Even though Webkit is in some ways just mimicking Firebug, it is a good step for future web development on Safari. Even more as the new Webkit builds contain less than the usual number of browser quirks that make programming Safari difficult in the Ajax world. The Webkit nightly builds provide the new feature by a right click on the page, selecting "Inspect Element". For more info, see the blog post on Surfin' Safari Webkit blog.